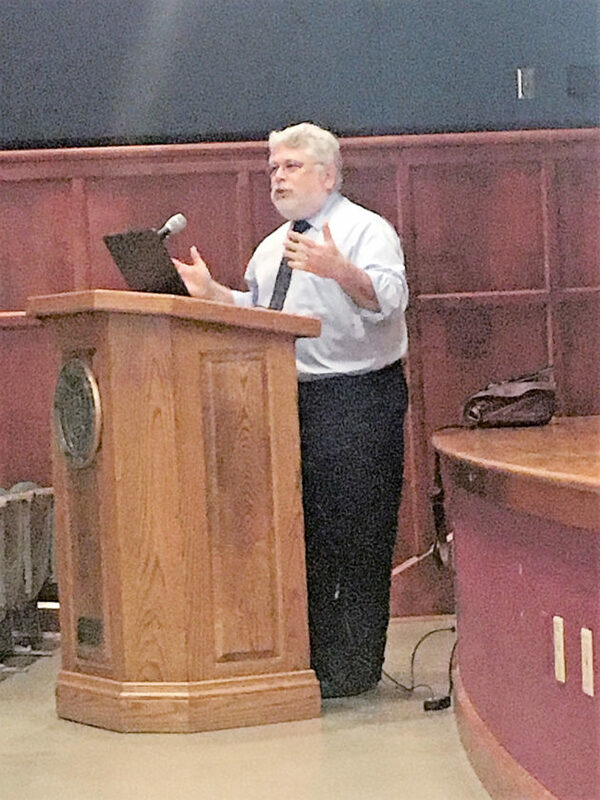 PHOTO BY NICOLE WALBY Richard Gale spoke to area higher education professionals Monday during the eighth annual Scholarship of Teaching and Learning Conference in Chisholm Auditorium on the campus of Tiffin University. Students were the focus of the eighth annual Scholarship of Teaching and Learning Conference Monday, which was hosted on the campus of Tiffin University. The conference offered the opportunity for higher education professionals to learn about innovations in teaching strategies and to share research. “We wanted the chance to bring people together who work towards the same thing that is so important,” Peter Holbrook, provost at TU, said. Holbrook said the conference is intended to develop a knowledge base for higher education professionals to continue at the highest levels. Gale spent five years at Calgary’s Mount Royal University as a visiting scholar and founding director of Mount Royal University’s Institute for Scholarship of Teaching and Learning and a tenured professor in the department of general education. He also served as a senior scholar at The Carnegie Foundation for the Advancement of Teaching. Gale said his main focus was collaboration with students and to open a dialogue to discuss how people teach and to learn how to teach. From that, Gale discussed learning from student learning, learning in the company of others and learning through wonder, unease and understanding. “I want to help improve student learning so that we can do better as teachers in order for students to do better,” Gale said. Gale said through his teaching, he wanted his students to have no need of him in the classroom. “I want them to work toward a goal they’ve devised and I want to sit and watch (self discovery) happen,” Gale said. Gale said by collaborating with students to teach, it has rewards for the student and the teacher. The conference also featured breakout sessions Monday and today on three different topic points, including teaching and learning, student engagement and curricular design.